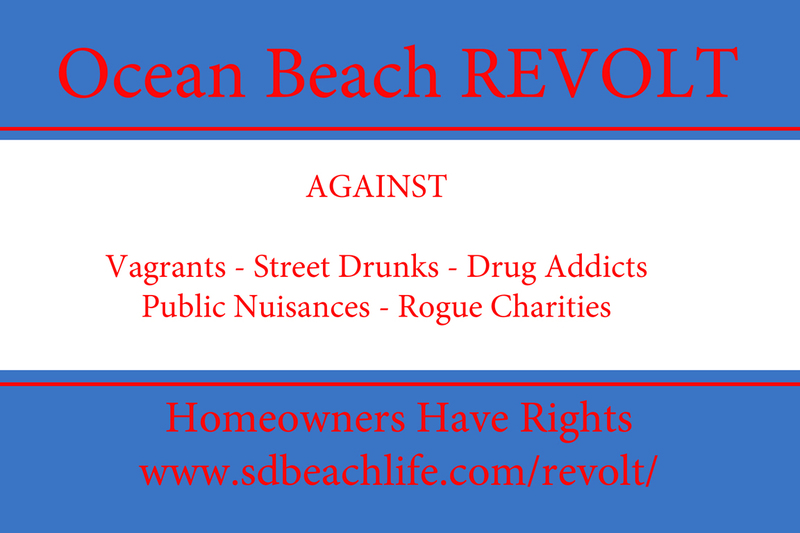 This web-page will be devoted to the residents and property owners of the Ocean Beach Community of San Diego, California, and their REVOLT agaist the Vagrants, Street Drunks, Drug Addicts, Public Nuisances, and The Rogue Charities that support their takeover of our community. The unfortunate truth is, that the majority of the so called "Homeless" in the Ocean Beach area are in fact people who have chosen a lifestyle that is non-productive and disruptive. Many so called charites have enabled these people to enjoy a subsistance level street life that is harmful to the community. Few if any of the people involved with these "Rogue Charities" live in Ocean Beach and as such do not suffer the ill effects of having a well supported group of Vagrants, Drunks, Drug Addicts, and Public Nuisances. The Police of San Diego have been prevented from dealing with this problem by a city government that is unwilling to address the issues. It is now time for people who are renting residents, home owning residents, and other property owners to develop a resolution to this problem. If you are a resident, home owner, or residential property owner please join me in resolving this issue. The Villa at Mogosa is in the background.